Bob Woodward, author of "Fear: Trump in the White House." 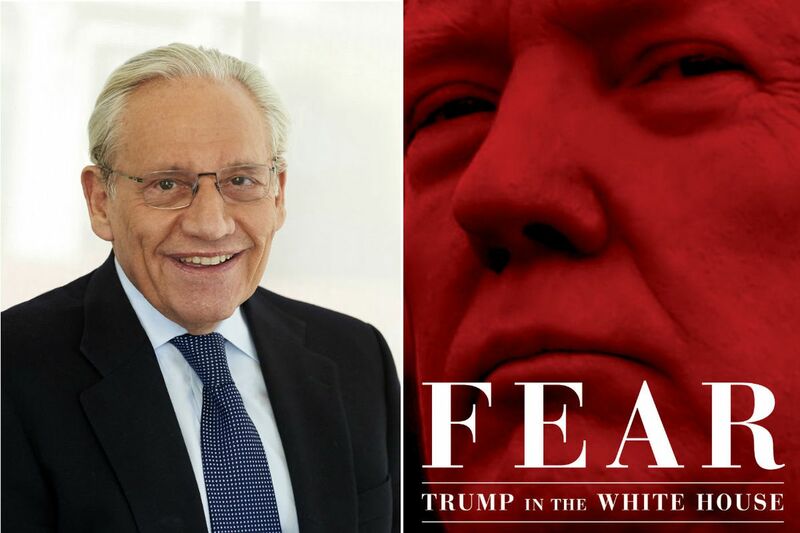 The last thing I expected in interviewing Bob Woodward about his book Fear: Trump in the White House is that, in mid-discussion, he would stop and apologize. Woodward will visit Philadelphia on Thursday for “An Evening with Bob Woodward” at the Merriam Theater. The Pulitzer Prize-winner and Washington Post associate editor is famous — even notorious — for avoiding emotion when he writes. All the President’s Men, the 1974 investigation he co-wrote with Post colleague Carl Bernstein about Watergate, is exciting for what it says, not how. Amid tales of ignorance, obduracy, and chaos in the president’s office — and all-but comic staff efforts to head Donald Trump off from bad decisions — the book strives to be even-handed. Yet here was Woodward getting upset. Woodward spoke further about Fear, about Trump and his inner circle, and about the ethics of using unnamed sources. I read Fear when it came out this fall, and again in the last week. You know what struck me? All the people who surrounded Trump in your book — former White House Chief of Staff Reince Priebus, Chief Economic Adviser Gary Cohn, Secretary of Defense James N. Mattis, White House Staff Secretary Rob Porter — are all gone. These people are gone because they’ve been humiliated and crushed and discarded. Look at the story of Gary Cohn. You can criticize him, I suppose, regarding the tax reform plan, which favored the rich. But he, this former president of Goldman Sachs, makes a sincere effort to educate President Trump about the economy. Yet Trump just disregards and dismisses him. With Mattis, here you have this accomplished, proud general, and Trump wants to send him to Europe and collect NATO dues from the allies, as if that’s his proper role. ... He calls Priebus a rat and calls [former U.S. Attorney General Jeff] Sessions mentally retarded. It’s administration by insult. His staff performs what you call “no less than an administrative coup d’état,” hiding papers, “slow-walking” certain topics or documents, keeping information from him lest he do the wrong thing. That’s the story of my book: Staff members taking papers off his desk so he won’t make bad decisions. Even Porter was trying to slow down the train, especially as regards international treaties, which Trump seems disposed to destroy right and left. When Trump starts talking about ending NATO, Mattis and Cohn take him over to the Tank, this windowless conference room the chiefs of staff use at the Pentagon, to try to persuade him that the international network of alliances is a good thing. [Then-Secretary of State Rex] Tillerson tells him that it’s helped keep us out of wars for 70 years. Trump disagrees, and [then-chief strategist] Steve Bannon helps Trump derail the meeting over the Iran treaty. His then-attorney John Dowd does some mock interviews with Trump, trying to gauge how he’d do if he spoke to special counsel Robert Mueller. Dowd tells him, “You can’t testify. Don’t do it. You’ll end up in an orange jumpsuit.” He just felt Trump was incapable of telling the truth. Did you try to interview the president for Fear? To be candid, I broke my spear on it trying. That’s my duty. He says he never received a formal request for an interview. I tried everyone I could think of. He claimed no formal request, although later he said [Sen.] Lindsey Graham had told him I was seeking an interview. I went through six people in the White House or close to him and couldn’t get through. I’ve done this a time or two with presidents before, after all. And then when the book comes out, he complains I never talked to him. We finally did do an interview we published, but too late for the book. He and others have criticized your use of anonymous sources. You have a passage in the introduction of Fear where you lay out the rules and circumstances under which you do so. I understand why people may have questions. But what I say is, look, you can’t go to some government worker or official’s house late at night when you’re working on a story and say to them, “Tell me what is going on, tell me on the record.” What you’ll get is a press release, not the truth. But what you can do is work on deep background. If information is given to me on deep background, I’m not going to say where I got that information, but I am going to check it, and try to confirm it with other sources, multiple other sources. That can be documentary sources, notes by others present at the same event, or other interviews. And I spell that out in my introduction and notes. Really, in so many cases, other documentary sources and notes are there to confirm it. The meeting in the Tank, for instance. We know that happened and we know who was present. At another meeting, Reince Priebus’ office, we know: The following people came in, Tillerson gave a review, [former National Security Adviser H.R.] McMaster comes in, and they get into an argument. People took notes. In the case of the paper Cohn took off Trump’s desk, we have a picture of it, you can read it for yourself. Some of these sources have issued non-denial denials. But no one has called me up with complaints, saying what’s in the book isn’t accurate or didn’t happen or isn’t what they said. And now we have the partial government shutdown. It’s a hard case. Trump has just dug himself in on the wall. Anyone who knows anything about negotiation is that you have to be willing to compromise at some point. But he’s dug in, and the Democrats are feeling their muscle. But let me be an outlier on this. The whole impasse is over $5 billion, which is truthfully nothing. To hold everything up over that is pretty silly. Why don’t the Democrats say, “Let’s give him his $5 billion and show people we’re serious about getting the government open again and making government work”? They can get some of the things they want and declare gridlock over. That would be a great accomplishment for your first week in power. 7:30 p.m. Thursday, Jan. 10, Merriam Theater, 350 S. Broad St., $59-$69, 215-893-1999, kimmelcenter.org.